In her new world, Rewaa al-Najjar, carrying the watering pot, moves among the beautiful flowers which she has decided to make the plan that will save her from unemployment. 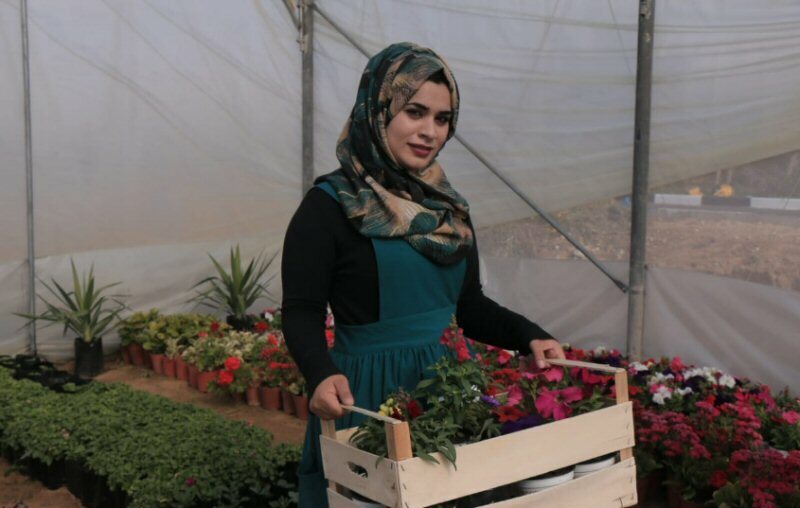 The 22-year-old graduate, living in Bani Suheila town in the southern Gaza Strip province of Khan Younis, spends most of her day in a greenhouse neighboring her home where over 20 varieties of flowers and roses are planted. Once you enter the nursery, the colorful and harmonious scene of the flowers immediately attracts you like a painting created by a seasoned artist. Rewaa wakes up in the early morning hours and starts working at the greenhouse among the flowers, her friends and source of livelihood at the same time. The ambitious young woman said that she spends most of her day inside the 100-square-meter nursery, and that she is looking forward to bringing more flowers and roses in the near future. Rewaa told the PIC reporter that her decision was not easy given that the profession in the Gaza Strip is exclusive to men. The circumstances did not prevent her from doing what she wanted. Rewaa graduated from the faculty of nursing at the University of Palestine and found no job opportunity except to volunteer in a number of health institutions in the Gaza Strip. She later decided to launch her own project. “I saw an advertisement by Save the Future Society offering to adopt agricultural ideas and initiatives. I registered and was accepted three months later. After that I received practical training in agriculture,” Rewaa said. Al-Najjar attended a training course on the basics of agriculture and how to cultivate flowers and how to deal with them. She conducted a two-month feasibility study and visited many nurseries to know the names and prices of the needed plants before she started the project. Rewaa pointed out that at the beginning she faced some difficulties persuading her family and neighbors of the feasibility of the project and her ability to implement it. She had self-confidence and worked hard until she was rewarded with success. The young woman said that in the next few weeks she will start picking her first batch of flowers and roses and selling them in the local market, hoping that the project will see more success and she starts exporting roses abroad. Rewaa’s greenhouse is home for many kinds of flowers and roses including Damask roses, petunia, aster, red and yellow palm flowers, and cactus of all kinds. She is now planning to grow citrus there soon since it is widely demanded by the Gaza Strip people.